We’ve collated the weather charts for Lanzarote for you below. Lanzarote has a lovely all year round climate, some sat the best weather in the world! The temperature chart below shows the average minimum and maximum temperatures for each month, in the coldest months of January and February the temp can drop to 14 degrees over night and up to 22 in the day, in the hottest months July through to September, the evening temperatures are 20 degrees celsius and the daytime an average of 29 but can reach into the 40’s. Lanzarote has a low annual rainfall of 125 – 150 mm per year, the winter months of November through to March are the wettest. Typically the rain will fall suddenly and then the sun will come out after, its still warm enough to enjoy the beaches and swimming pools all year round. 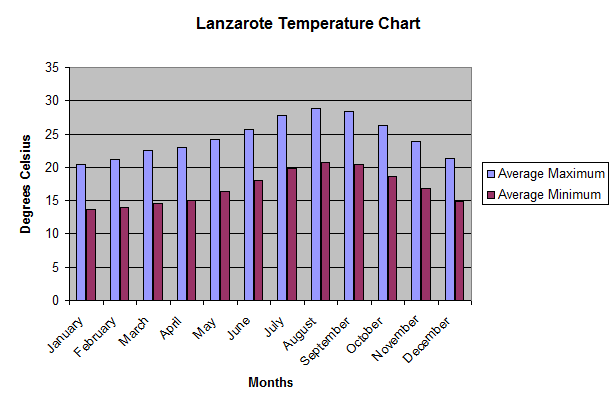 Lanzarote has an average of more than 300 days of sunshine each year, and from 6-11 hours of sunshine per day, the lowest month is November and the highest months are June and August. Lanzarote is known for the trade winds which blow North – North Easterly, the windiest month is July with an average wind speed of 19 knots but its generally blowing 10-14 knots all year round. What ever the weather, you’re sure to have a great holiday in Lanzarote. If you prefer not to rely on weather charts and would like to read more, go here: Lanzarote weather. Villa Cinco Palmas is a 3 bedroom villa with private heated swimming pool, located in the San Marcial de Rubicon area with fabulous views.